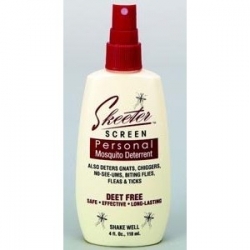 Skeeter Screen Personal Spray 4 Oz. This bug spray is a top seller at Teerman's! The Scent Shop Skeeter Screen Personal Spray is a water-based essential oil formula that helps protect the entire family from biting insects. It is deet and pyrethrin free and contains no insecticides or herbicides. Biodegradable and earth-friendly, this convenient pump spray may be used on both skin and clothing. It is non-staining and not oily or greasy and lasts for hours. Don't let annoying insects ruin your outdoor activities. Drive bugs away and keep them away with Skeeter Screen Personal Spray - It Really Works!